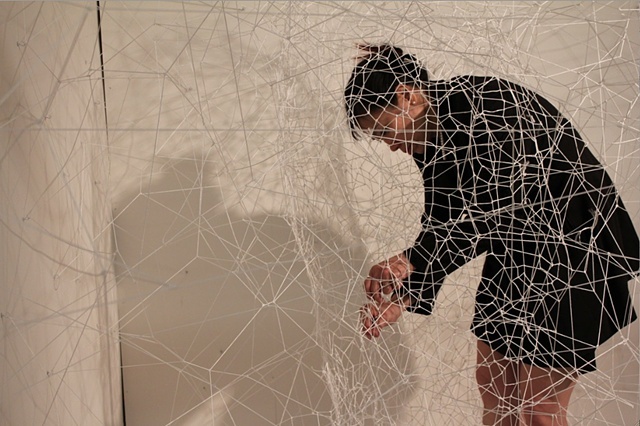 The Silk Cocoon involves the combination of performance, sculpture and video. I am investigating the choices that women have under cultural patterning. Despite extraordinary efforts women have made to create opportunities for independent choices, I am questioning, under cultural context, whether these hard-earned choices are real choices or just the illusion of choice. I was born in Hong Kong. But my original hometown in China is a city called Shun De. For hundreds of years, the main industry around the Pearl River Delta, where Shun De is situated, had been silk production. The industry was mainly supported by women work force. This situation allowed women in the area to gain enough economic power to resist the feudal marriage system. Almost all women in all of Chinese history had only one option in their life  to get married  which a lot of times would mean becoming second-class citizen in a strangers family. While women in Shun De had created for themselves an additional option -- a legitimate, acceptable social position of spinsterhood. Any woman in Shun De, if she chooses to, can perform the ceremony of self-combing and take the vow to be spinster. My ancestors broke the two-thousand-year social system just by raising the little vulnerable silkworm. They gain independency by creating for themselves choices that was unheard of in all of Chinese history. At the same time, they had to sacrifice a lot. They were trapped in the spinsterhood, the vowed celibacy and the life-long labor. I myself, as a modern woman, thought that I was lucky enough to have wide range of choices. But I still have to work very hard in the business world, sacrificing a lot in order to create my own financial independence. After all these years, I realized that I am still weaving the same cocoon, as my ancestor, as those silkworms. I am still trapped in the cocoon that I weaved myself.